What does a “Scottish Wedding” mean today? But food? As caterers we’re occasionally asked to provide a “traditional Scottish wedding menu”, but often people don’t really know what that entails. Indeed our research shows there seems to be not definitive answer. A google search on “traditional Scottish Wedding Menu” threw up a Borders Hotel, whose sample wedding menu included Gazpacho, dauphinoise, lots of jus and prailine cheesecake. It’s not evoking misty Glencoe mountains, lowland glens or any patriotism in us. So what is it? What it doesn’t mean is stuffing low grade haggis in whatever orifice your main course provides, offering mass produced smoked salmon so gaudy in colour it might well have been marinated in Irn Bru or dowsing each menu option in whisky. As Scottish and quirky a Tunnock’s Tea cake wedding centre piece may be, stand alone it’s not reflecting our heritage on a plate. For us it’s a focus on Scotland finest produce: the best grass fed beef, traditionally smoked salmon, venison, blackface lamb or spanking fresh Scrabster fish. These are the prime stars of the Scottish larder. Beef fillet, roe deer venison & spanking fresh scallops are Scotland’s premium ingredients, which does mean a premium price. If you are on a tight budget, you may get a caterer offering these as options at a price suitable to you, but it will be disappointing. If you are keeping costs down, why not consider dishes using cheaper cuts? 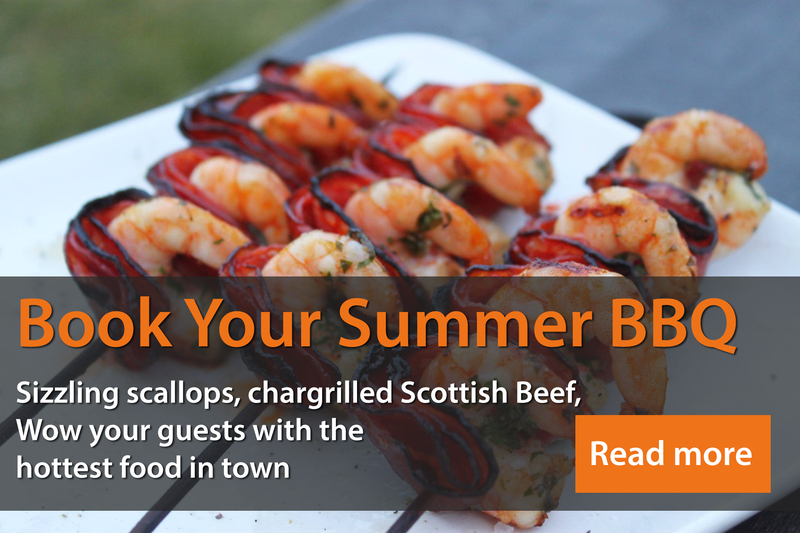 – think melt in the mouth blade steak stew – or feature those prime time guys in your canapés instead. If you are looking to feature a “traditional Scottish food”, our advice would be to have a good think about your budget and be clear on how much you can afford to spend. With that information, any caterer worth their salt will be able to design a menu to showcase your Scottish roots. Be realistic with your expectations, don’t cut corners on quality and do opt for Scottish produce over Scottish theme. You won’t be disappointed.